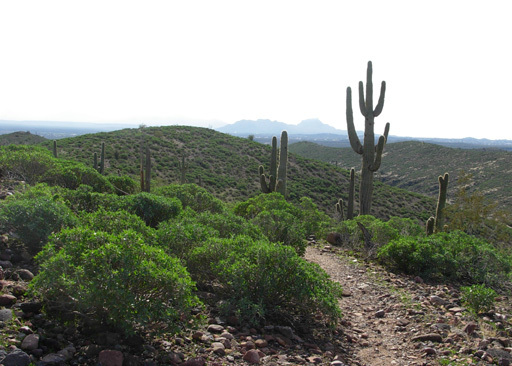 Arizona's capital city offers much more than great weather . 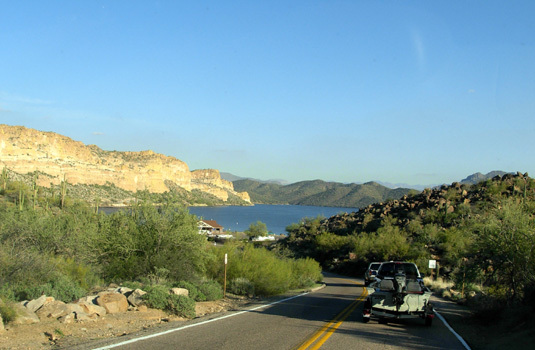 . . "
After the weather started warming up to normal January temperatures in the 60s two weeks ago in the Phoenix area, we were very happy campers. Literally. The wind here at McDowell Regional Park blows pretty continuously, though, making it a bit chilly to sit outside the camper during the day. It's perfect for running, however. We've been doing more of that since ATY than I thought we could do. We've covered nearly every inch of the fifty-or-so miles of trails in the park at least once. I'll include lots of trail photos in this and subsequent entries. 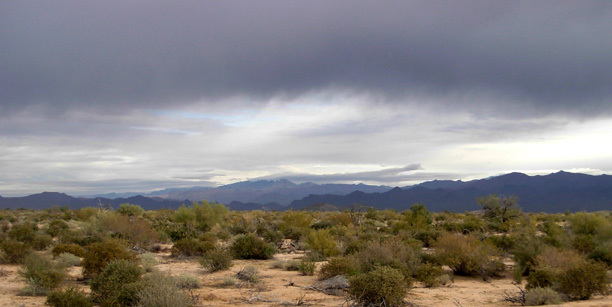 We can also tell you that it gets mighty cool at night in the Sonoran Desert in the middle of winter.-- probably not as cold as it is at home right now, but at or near freezing some nights. 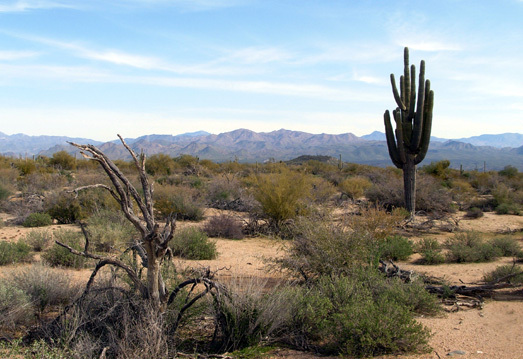 (Deserts also tend to cool down considerably at night in the summer.) Even with two small electric heaters and our propane furnace we've been hunkering down between heavy flannel sheets at night, with two or three layers of fleece blankets over those and a bedspread on top of everything. Fortunately, we haven't had any problems with the water freezing in our tanks or in the hose to the water connection at our campsite. It's obvious the area needed the inch or two of rain that fell. Within a few days the desert was noticeably greener and we spotted more wildlife. 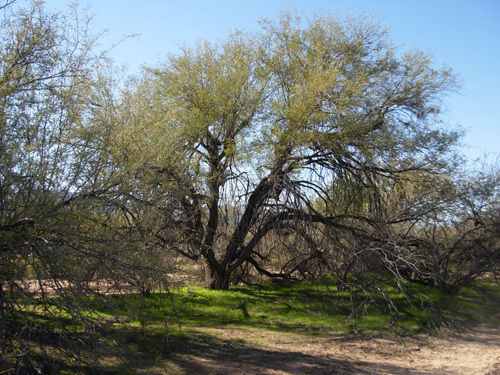 There were new little tufts of grass among the cacti and shrubs near our campsite and along the trails, especially in the shade under trees and near the washes. 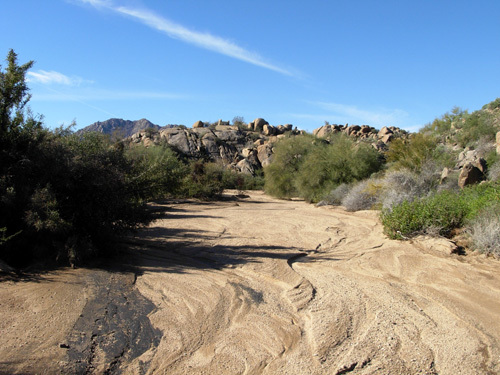 Most of the washes at McDowell have been dry when we run across them on the trails, even after the rain, but you can tell water has flowed through them previously when the rain or snowmelt has been heavier. Bottom line on the weather so far: daytimes have been mostly pleasant this month but the Phoenix foothills haven't been quite the balmy retreat we expected since we're higher in elevation (up to 3,000 feet) at McDowell Park than in the valley (about 1,100 feet) where metro Phoenix lies. Spring and fall would probably suit us even better in this area, with temps just a tad warmer but not searing. I'd love to see all the desert flowers in the spring but we can't stay here that long this time. Summer? No, thanks. I doubt we'll ever visit here in the summer! We'd melt. One of the reasons I love to visit new places is to learn more about the cultural history of the area. 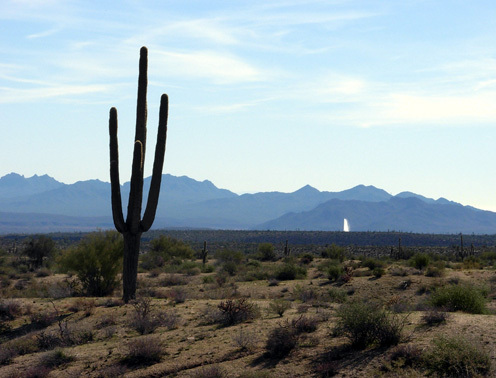 Phoenix is a rich medley of Native American, Mexican American, and American West cultures. 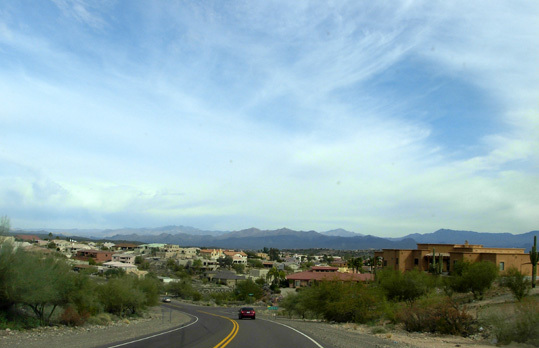 One of the ten largest metropolitan areas in the country, Phoenix -- and adjacent cities like Scottsdale, Mesa, Tempe, Sun City, and Glendale that make up its SMA -- is 'way more "modern cosmopolitan" than "cowboy." There are numerous museums, art galleries, theatres, the University of Arizona and other colleges (yes, the ubiquitous University of Phoenix is here! ), upscale stores, ethnic restaurants, historical sights, and other diversions for residents and visitors. And it's huge, probably as spread out as metro Atlanta, where I lived for twenty-five years. With "huge" comes not only a plethora of opportunities for entertainment, education, recreation, and shopping, but also traffic and crime. I've been away from a lot of that for nine years in Billings and Roanoke, and Jim's never lived in a large city like this, so it is a bit disconcerting to us. We have done our best to avoid the rush hours and being in the city after dark. When we arrived I made a list of about twenty places I wanted to visit. We've been to only a few of them in the last two weeks, however. There are two main reasons: 1) our desire to save money on diesel fuel, which has increased in price significantly since last summer, and 2) our even more ardent desire to avoid travel on congested urban streets and freeways. Every time we think about going somewhere we weigh the cost, time, and aggravation -- and usually end up exploring more of McDowell Park or relaxing at the campground! Not only is the metro area itself humongous, but we're also beyond the suburbs at McDowell Park. It took us two hours to drive from Nardini Manor in the western 'burbs to the park on the eastern metro fringes the day we moved our camper here. 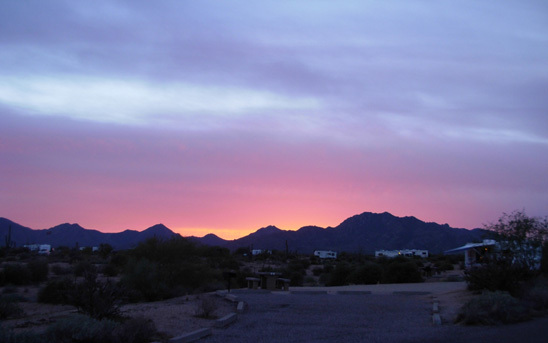 We're very happy with the spacious camp sites and beautiful desert vistas (mountains in every direction!) -- but it's a 25-mile drive to the nearest YMCAs in Mesa or Scottsdale and even farther to favorite stores like Costco and REI that we don't have at home. Heck, it's even that far to a nice super Wal-Mart. The time and diesel fuel really add up if we make the trip to Mesa or Scottsdale more than a couple times a week. The city of Phoenix and most of the places we wanted to see are even farther. Checking out Sunbird Central, i.e. Quartzite, near the California border was a consideration until we did the cost analysis. Nope -- easier to stay put. Such places will have to wait for future trips when we aren't so miserly. Meanwhile, we've still been able to enjoy the unique architecture of the region, various communities in the metropolitan area, some of the surrounding mountains and parks, and a wonderful little Mexican restaurant near the Mesa YMCA. My list of "things to do on the next trip" is growing. 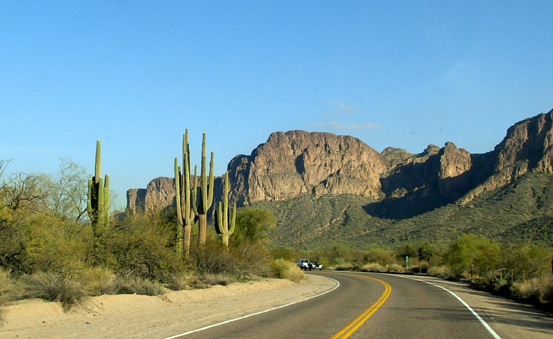 Besides lots of things to do in and near Phoenix in future trips, I also want to head north to the area between Prescott and Flagstaff to see the beautiful Red Rocks area again and revisit some interesting towns like Crown King, Cottonwood, Sedona, and Jerome. I want to explore some of the fascinating ruins in that area, too -- ancient Hohokam, Singuan, and other Native American cliff dwellings and art that date back to 11,000 B.C. 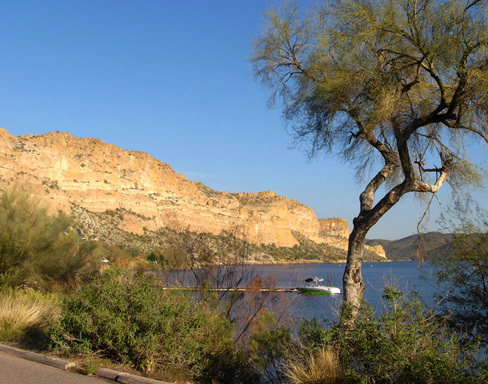 (e.g., Tuzigoot, Montezuma's Castle, Palatki, Honanki, Wupatki, Walnut Canyon, and pictograph and petroglyph sites). It's significantly higher up there than around Phoenix so January weather is definitely more wintry. While we were getting rain in two weeks ago, that area got several inches of snow. You know how Jim avoids snow! We'll just have to come out here in the spring or fall sometime. That would be a better time to visit the Grand Canyon again, too. One of the things I miss the most on our extended camping forays is being able to do weight training like we do several times a week at our YMCA at home. We have the good fortune to be able to suspend our membership for the months we're out of town (without having to pay to rejoin when we return) but we lose some upper-body fitness while we're traveling. This trip is different. We kept our membership alive through January because the Phoenix area has YMCAs we can use while we're here. Now it won't be as difficult to get back into our weight routine when we return home. We've used both the Scottsdale and Mesa Ys. They are nice, but not as big or well-equipped as ours in Roanoke. We appreciate our facility even more now! 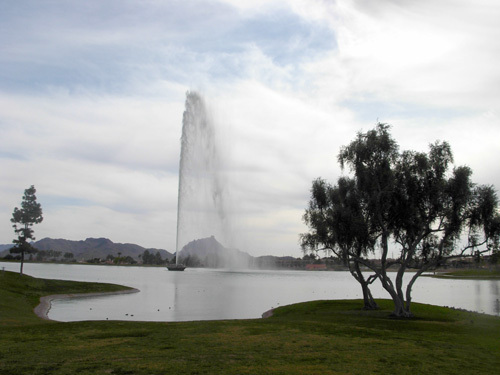 The fountain is turned on for fifteen minutes at the top of each hour. Somehow we usually miss it when we're driving by it on Saguaro Blvd. (since it's turned on only part of each hour and only when it's not too windy). But we can see it from our campground and the trails eight or ten miles away, every hour on the hour from mid-morning till about 10 PM! Very cool, especially when it's lit up at night. Despite some inconveniences we have thoroughly enjoyed spending lots of time at the park and we'll miss it when we leave. 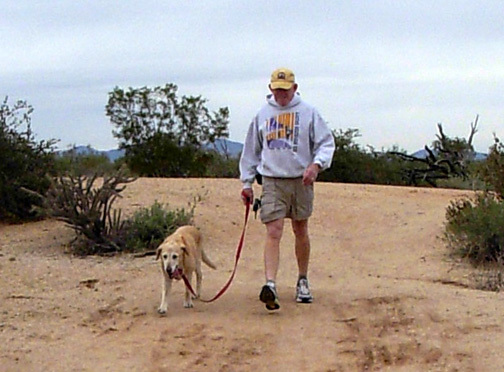 We run or walk every morning and have explored more of the trails than some local runners. Even though we recovered very quickly from ATY it's been a pleasure to chill out most afternoons, just doing errands and chores, tinkering with the camper and truck, playing with the dogs, visiting neighbors, reading, writing, taking photos, etc. Jim and Tater enjoy a hike on the Pemberton Trail January 4. I've managed to keep busy enough that I'm 'way behind on this journal, and that's one of my favorite hobbies. I'm taking lots of notes and I'll collate all of it later when I'm back at my familiar computer and have a speedy DSL connection..
Next entry: more photos, history, and other information about McDowell Mountain Regional Park. Come along and see why we love it so much!